Swash-buckling humor and a heroic trope. There are a few solid scenes scattered throughout this film but what's in-between those scenes is middling to bad. It's almost as if they forgot what made the first film good. There is fun to be had with this late sequel. However it is severely let down by a lack of interest from most of the cast. Some unnecessary leaning on CGI effects leading to a lack of real stunts. Some forced comedy which only lands about half the time. 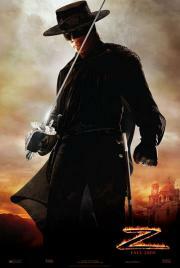 It is only redeemed by Antonio Banderas' continuing efforts as the lead.